San Francisco, USA -- By now we have all heard about the amazing health benefits of chinese green tea. Long used medicinally in China, it has become increasingly popular around the world. Is there a difference between tea grown in China, and tea from other places? What are the origins of tea, and how did it become so popular? Tea is thought to have originated in China at least 2,000 years ago. Because of the time that has passed since then, mystery surrounds the actual beginning of tea-drinking. A legend says that an early Buddhist Master discovered tea. Another legend has it that the Chinese agricultural god Shenong invented it by chewing the leaves and spitting them into a cup of hot water, in order to test the toxicity of the leaves. Still another variation of the same legend says that one day a tea leaf blew into his cup, he looked at, then sipped it, and the result was tea! Biologists have determined that there are two slightly different tea plants. One is native to India, Burma, and the Yunan province of China. The other is found in eastern and southeastern China. The plants are similar enough that they surely have a common ancestor, and the tea they produce is the same. Tea was cultivated on a massive scale under British rule. Mechanization was introduced, and tea was grown and handled with an eye toward export. From this time on, tea traveled to the corners of the world. The purported health benefits of this beverage are almost endless. 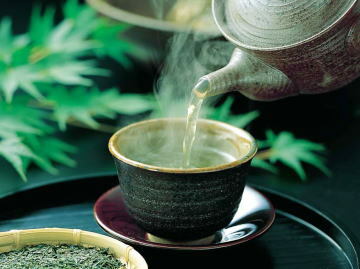 High levels of antioxidants have led to studies showing that green tea may be a cancer fighter of the first magnitude. Other benefits of daily consumption of green tea include: lower cholesterol, weight loss aid, soothing, lessening the effects of diabetes. Green tea is even used in wrinkle creams and moisturizers. The antioxidants it contains are thought to fight aging in the skin. Chinese Green Tea Versus Others? In reality, it is most important to drink tea that is grown, picked and processed carefully. Loose tea is always preferable to tea in bags. Tea that has been picked during the right time of year, and has been sun-dried and withered to achieve the proper amount of fermentation, will be your best bet. The Chinese have been doing this longer than anyone else!